Paperback, 8 x 10 in. / 64 pgs / 60 color. Stills, drawings, etchings, engravings and designs by the cult animators. Edited by Ron Magliozzi. Text by Edwin Carels, the Quay Brothers. For more than 30 years, internationally renowned moving image artists and designers the Quay Brothers have been in the avant-garde of stop-motion puppet animation. Creating work in the tradition of Czech Surrealists Jan Svankmajer and Jiri Trnka, Russian animator Yuri Norstein and Polish animator Walerian Borowczyk, the twin brothers practice a design aesthetic influenced by the graphic surrealism of Polish poster artists of the 1950s and 1960s such as Jan Lenica, Roman Cieslewicz, Franciszek Starowieyski and Henryk Tomaszewski. Since 1971, they have produced more than 45 moving images, including features, music videos, dance films and documentaries, and have designed sets and projections for opera, drama and concert performances. 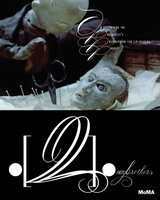 Published to accompany an exhibition at The Museum of Modern Art--the first presentation of the Quay Brothers’ work in all their fields of creative activity--this publication presents their films as well as previously unseen moving image works and graphic design, drawings, typography and notebooks for films. The Quay Brothers were born near Philadelphia and have worked from their London studio, Atelier Koninck, since the late 1970s. Their works include The Street of Crocodiles (1986), the Stille Nacht series (1988–2008), Institute Benjamenta (1995) and In Absentia (2000). They have also designed sets and projections for opera, drama, and concert performances such as Ionesco’s The Chairs (Tony-nominated design, 1997) and recent site-specific pieces based on the work of Bartók and Kafka. Featured image is reproduced from Quay Brothers: On Deciphering the Pharmacist’s Prescription for Lip-Reading Puppets. They are miniature dioramas, packed with amazingly intricate details, and are clearly meant to be taken as self-contained artworks in themselves. We can also see some of the puppets that have been moved about on these sets. Amorphous as the Quay universe may sound in such an account, there is an underlying tenor to their art. It is, one might say, the meeting place of the macabre, the tormented, and the fantastic. "At once a marvel and a marathon...the exhibition itself leaves no doubt that the Quays are masters above all of an unusually entrancing form of stop-action animation they unveiled in 1979. 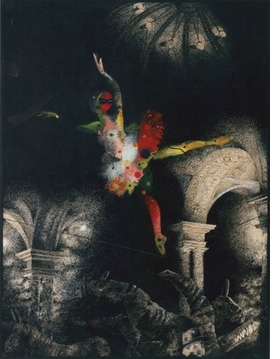 Fraught with unresolved dreamlike narratives and psychosexual tensions, these works draw on the Surreal, the Gothic and the Victorian and also reflect the Quays' deep attachment to the literature, graphic arts, animation and music of Eastern Europe, which they have cultivated since their art-school days. " – Roberta Smith, The New York Times. FORMAT: Pbk, 8 x 10 in. / 64 pgs / 60 color.